Customer Experience Journey Mapping (CXJM) has become a commonly used approach for many organisations attempting to design innovative new processes that improve the experience for customers. The objective is to identify emotional “moments of truth” for different persona’s at different stages of a customer journey. For most organisations, there are many different “persona’s”, touchpoints, channels and this results in the work to map out entire customer journeys as being a lot of hard work. However, this does not mean that the exercise is futile. Far from it. Done well, the mapping brings to life those moments that matter to a customer (and when I say customer, you could substitute the word Employee, Partner, Citizen or Visitor just as easily). In the example below, the journey was of a patient attending a MRI Scan. Without wishing to delve too deep into the methodology or process of the CXJM exercise, I am fully bought into the value it brings in identifying the key points that impact on a Customer Experience. Some might be obvious (e.g being routed to another Call Centre agent to whom you have to repeat all the identification process and explain, again, why you called). Others are more subtle (e.g Being forced to create an account online for what is likely to be a one-off purchase). However, the question that I am often asked is why the process of CXJM often leads to….not a lot. I was at a CXJM introductory event recently where the delegates were asked to put their hands up if they had ever done Journey Mapping before. Approximately 50% of the audience enthusiastically put their hands up. They were then asked whether the outcome of the exercise had been worthwhile. Again, almost all of the original hands remained up. Finally, they were asked whether they had implemented changes based on these findings. The hands in the air disappeared rapidly leaving just one or two delegates awkwardly looking around as if they had done something wrong. This is not unusual. I often hear of organisations who “did” Journey Mapping but the output is on a shelf or in an archive file somewhere. So why is that? Journey mapping, done correctly, identifies everything that is needed to positively impact the experience. The players, the technology, the process and policies. However, this is also where it runs into trouble. It becomes too darned tricky. It is easy to identify a problem but is not often as easy to fix it. It may require money, time and stakeholder buy-in that exceeds the perceived value of the exercise. One of the biggest challenges is that to address any given issue requires input from a variety of sources that may be external to the initial Journey Mapping exercise. For example, what may seem like a small change to a website to a CX practitioner could require scheduled effort from Web Developers, Testers, Project Managers, Technical Analysts, Product Owners and many others. The suggestion then gets put into the “too hard” basket and is “backlogged” into the “future feature” set which, as many frustrated Change Agents know, means “never”. I believe that more realistic expectations for the success of Journey Mapping should be set by planning a roadmap for change. The roadmap should be the next step after the CXJM and should focus on multiple, incremental changes based on the output from the Journey Mapping. The most immediate changes would be those where the biggest impact can be achieved with the minimal disruption and input. This might help avoid the time and expense of creating a Business Case. The days of Big Bang mega projects are (hopefully) in the past as the need for rapid and innovative change lends itself nicely to multiple, smaller Agile projects. However, Journey Mapping should also help identify the measurements of success that would be needed to justify any proposed change. Perhaps the changes could be classified and viewed as per the matrix below? So how does one know how to categorise and prioritise the changes? Firstly, I would suggest creating an agile cross functional team, with the CX leader acting as Product Owner. By cross functional, I do not mean technical. It should be a blend of Business and Technical skills that can assess and prioritise. For this team to determine the delivery roadmap, the sponsorship of a senior leader is essential in being able to take the next steps and remove roadblocks. Being able to demonstrate success through regular small change from a customers perspective will give an impetus to the roadmap as well as delivering a tangible return on any investment. Secondly, I would not assume that your organisation knows everything about its customers experience. Involve them. Bring in a Customer panel or forum. Interview them. Appoint customer champions. Do whatever is necessary to ensure that your roadmap WILL make a difference to your customers. In fact, I would involve customers in the Journey Mapping itself. Finally, ensure that the roadmap achieves a consistency of Customer Experience across all channels. Your Contact Centre can be the best in the world but if you then look to migrate people to lower cost channels where it takes twice as long to transact, then there is an inevitable impact on customer satisfaction. As Confucius once said, “A journey of a thousand miles starts with one small step”. Make sure that you have the roadmap for your journey and then be brave enough to take that first step. I look forward to hearing more clients starting to get great outcomes from their Journey Mapping. Author Nick DaveyPosted on February 8, 2018 February 13, 2018 Categories CRM tools, Customer Experience, Customer Management, InnovationTags Customer Experience, customer strategy CRM, TransformationLeave a comment on Customer Journey Mapping? Been there, done it, so what? Choosing a CRM is easier than choosing a TV…..
or maybe it should follow just the same set of thought processes. It certainly should not be overly onerous. This blog suggests why…. I blame it on “Game Of Thrones”. If it wasn’t for the fervour created in our household by the imminent arrival of the latest instalment of the annoyingly addictive GoT, I may not have found myself in the HiFi store in the first place. I mean, we do have a “spare” TV and it’s not as if we watch a lot of TV. But she who must be obeyed (my wife, not the Mother of Dragons) insisted on us having to replace the TV in time for Jon Snows latest escapades. So there I was in JB Hifi surrounded by wall upon wall of TV’s showing the same identical Disney movie, hearing the same soundtrack in a barrage of echoes, thinking this “should” be easy. I mean, we just need a TV. I have helped procure and, turning gamekeeper into poacher, sell complex enterprise CRM systems. These systems can cost thousands, if not millions of dollars in terms of software, services and support. It can take months to go through an evaluation and procurement exercise so surely buying a TV cannot be that hard, can it? However, very soon I was being pummelled by an enthusiastic young “Audio Specialist” asking seemingly stupid questions such as “What do you use your TV for?”. I felt like saying “doing the washing up” but before I had chance, he bombarded me with a plethora of use cases “downloading films, watching YouTube, gaming etc”. Whilst I was scratching my head thinking, he was telling me about features such as HD, UHD, SUHD in fact any other acronym with HD would have seen me thinking he being sarcastic. There is 3D, Curved, Super size (more like a cinema screen), 4Hz and the mesmerising list goes on. The result was that I got to thinking about how people choose a CRM and that perhaps it can get over complicated in a similar way. First and foremost, there is a budget for everything. I did not want to spend $7000 on a TV so the one that made an IMAX theatre look conservative was never going to be an option. Secondly, there was my needs. What did I need it for? All CRM’s do the basics but the nuances come in whether you are looking for a Sales, Service or Marketing oriented system. Of course, you will need a decent set of functional and technical (non functional) requirements but to me it is pointless saying that a CRM must be able to add an email address to a Contact. That’s like asking whether a TV has an on/off button. Then there was the “look” to consider. Believe it or not, the TV’s were not all identical! Similarly, the look and feel of a CRM must be intuitive and user friendly. This “User Experience” has become an increasingly important factor in choosing CRM software due to the lowering of training costs and the need for users to adopt the system, which is far more likely if they find it easy to use. Once I had gone through this thought process, I had quickly narrowed down my choice to two TV’s. Now to seal the deal, I needed to differentiate based on things like Warranty, Installation and Availability. These will also come into play when selecting a CRM Implementation partner, although availability in IT terms means something different than “is it in stock”. Focus on a partner with proven expertise in the selected technology. You would not take a Mercedes to a Ford garage would you? So when I got to thinking about it, I wondered whether sometimes people over complicate the buying process. Organisations can “try before they buy” with “Proof Of Concept” and Pilot implementations commonplace. In today’s Agile world, projects often commence on the basis that the end destination is not clearly defined, reserving the right to change direction and innovate as the project evolves. Choosing a CRM should be pretty simple. Be clear about what your desired outcomes and user expectations are, what your budget is (don’t forget, its all about the TCO- Total Cost of Ownership) whilst considering the broader picture (refer to my previous article suggesting that the choice of CRM is not the single biggest success factor). Although I have always been technology agnostic, I have recently become very excited by the development of Microsofts Dynamics CRM. It has evolved immeasurably over the last few years and the latest release, Dynamics365 is very good indeed. It will not be for every organisation just as my choice of a TV will not be the brand that you may have chosen. However, I do believe that Dynamics should be on most organisations shortlist not just because of the breadth of capability but simply because it just works with all of the other Microsoft software seamlessly. It is that ease of use that makes it a formidable solution and why, these days, I now work for an organisation that specialises in Dynamics365. Author Nick DaveyPosted on April 20, 2017 April 21, 2017 Categories CRM Consulting, CRM tools, Customer ManagementTags CRM, Procurement, Projects, Software, technologyLeave a comment on Choosing a CRM is easier than choosing a TV….. If you are asking “which CRM is best”, you may be asking the wrong question. Choosing the right tool is important but in isolation, it is probably not the decision that is going to make or break your initiative. This blog gives you pointers as to the questions you should be seeking to answer before looking at choice of software. If I was paid $1 every time I was asked “Which CRM should we choose” then I would not need to be checking the Lotto numbers each week! The trouble is that a widely held perception is that you need the “best” CRM. Questions such as these are posed based on an assumption that the choice of CRM software will determine the success or failure of the business issue or opportunity it is being considered for. I’ve therefore compiled a list of things that I consider to be critical success factors that need consideration by any organisation thinking about CRM, let alone purchasing CRM software. 1. What is your “why”? You clearly think that CRM is an answer but to what? Have you carefully listed all the requirements you have? Have you broken these into Functional and Non Functional? Have you prioritised? Are these based on what you want to do or what you do today, or both? 2. Do you know what benefits you are seeking to achieve and, if so, how these will be measured and realised? What must the future state processes, people and technology deliver to realise each benefit? 4. Do you have a Budget? It is not just the software cost that should be considered but also the “services” required to implement and support the solution. These services should include internal and external (3rd party) costs. 5. What is the customer impact and perception? How will this positively lead to a greater customer experience which will drive retention and lead to customer advocacy? Have you engaged with people who know what a Customer Journey map is and can help create Persona’s? 6. What is the appetite for change? CRM is as much about a change in culture as a change in software. I recently worked with an organisation that could tick most of the previous 5 boxes but change fatigue was such an issue that it almost killed the CRM initiative. 7. What other changes will need to be made to accomodate CRM? New devices, Cloud provisioning, Reporting and Analytics, Integration platforms, Channels, Service Providers, Business Process Reengineering and IT Support are just a few off the cuff considerations that need to be thought through. There are many more. 8. Do you have internal resources who could commit time to both evaluate and then help implement CRM? Examples include Subject Matter Experts (SME’s), Architects, Business Analysts, Project Manager, Legal and Finance. They may or may not be required on a full time basis and certain roles can be outsourced but you will need to allow for commitment from several internal stakeholders over a project lifecycle. 9. How does this initiative align to the overall company strategy and are there competing “projects” that might mean the timing is less than ideal? I see many companies attempting too much at the same time and therefore achieving little. Corporate portfolio management is a necessary discipline. 10. Finally, yes, the choice of technology is a factor but software is just code. It is a tool. It needs to be made to work in the right way. For that reason, your choice of Technology Integrator will be just as critical as the software they help integrate and implement. Look for partners that can demonstrate that unique blend of understanding your business and demonstrating previous examples of well designed solutions and delivered outcomes that are referenceable. Therefore, when someone next asks me “Which CRM do you recommend”, they will understand why I reply with ” Well, it depends….”. If you are in a position to proceed having worked through these things, then I believe you are well on the way to success and I look forward to hearing about it. Being recognised by an Industry body for game changing innovation is something I am very proud of. From concept through to delivery, a great team helped put together a solution which forms a new paradigm in Travel Sales. Timeshare is a concept that many are aware of but often the perception of what timeshare is can be very far from the reality. In its purest and original form, buyers purchase a share of a hotel room/apartment in a managed holiday resort. This share equates to a percentage of a year, usually a week. Historically, the purchase of this week bound the owners to holiday at the same resort at the same week year after year. It was a hard sell and became a haven for unscrupulous salespersons, developers and dubious incentive programs. This helped explain my initial cynicism. Over the years, the concept has grown and evolved into a multi billion dollar industry which even includes household brands such as Disney, Ramada (as part of Wyndham ) and Accor. Some schemes offer points, some varied resorts and others have evolved into travel clubs. There are now timeshare companies offering yachts, RV’s or even private homes as alternate travel options. Therefore, in early 2014, I became involved with Australia’s largest Timeshare Operator, Classic Holidays, who operate over 60 resorts in Australia and New Zealand. Its members have varied membership types representing the changes in the industry over the last 20 years and more. Despite the modernity of the new Timeshare programs, I was surprised to see that much of the technology used within the industry was very verticalised with few specialist providers. Those that did exist appeared to focus upon the property reservation and management aspect of the process rather than enabling a member centric perspective. Classic Holidays were using a myriad of Microsoft Access/Google Docs and paper driven processes to attract, recruit and create new Members. Once I understood the core business processes involved, I suggested that a Commercial Off The Shelf (COTS) CRM software tool could easily replace the tools being used and become the hub for Member Centric processes in the future. This met with some resistance as the commonly held perception was that the industry was so specialised that there was nothing that would meet the “unique” idiosyncrasies of the Timeshare industry. Therefore, after some product evaluations, I managed to persuade the Classic Holidays Leadership that SugarCRM seemed a good fit based upon functionality, price, usability, “openness” and being a SaaS based product. In August 2014, I was asked to create and then deliver a project for a new “end to end” Sales and Marketing solution as the first phase in transforming the (prospective) Member experience. We called it Project CHARM (Classic Holidays Advanced Relationship Management). I will explain how CRM was used to address and provide solutions in some of the unique Timeshare industry processes. The process of selling in Timeshare usually starts with Lead Generation with Off Premise Canvassers (OPC) representatives. The OPC role at Classic Holidays was primarily to generate leads by enticing prospects to attend a presentation through the use of scratch cards which offered guests the chance to win prizes. Those with winning tickets were invited to a presentation (tour) to collect the prize upon condition of attending a 90 minute sales presentation. OPC’s used their own phones to look up a shared Google Sheet to check availability at a given wave. The prospect would then be given a slip of paper confirming the date, time and location. To try to guarantee attendance, prospects were asked for a deposit (cash) and were given a paper receipt. Often, the prospect would change their mind and “no show”. Whilst the prospect might lose their deposit, the impact on the company was costly as the cost of holding Waves (a number of tours all starting simultaneously) was a fixed cost. I found it a very amateurish process for such a quality product and thought that if I was approached by an OPC, there was no way I would trust them enough to pay a deposit and give up 90 minutes of my time for something seemingly shrouded in mystery. Again, I was told that this was just “how it worked” but I felt that better tools, processes and empowered people could bring about significant transformational change. An application was created that acted as a “portal” for the OPC’s in the field. Each OPC was given an iPad with a direct link to the Portal. An OPC would log in to a personalised Dashboard. From here, they could review the status of previous bookings and add new bookings, thereby replacing the paper forms and Google sheets. We were also able to include a digitised version of the “pitch book”, a leaflet based piece of collateral that was often used by OPC’s to show imagery of the Classic Holidays resorts. Since OPC’s only had a very short space of time to make the booking and collect the deposit, the User Experience was a vital part of the design, ensuring it was quick to use, well laid out and met the User Stories that were developed in our Agile Project. A key function was a real time look up of availability of each wave at any location. This ensured that Prospects were booked to waves which had availability. When an OPC made a booking, it was previously hoped that the Prospect would turn up. CHARM introduced additional communications with the Prospect which consisted of a SMS and/or eMail confirmation, a link to a new landing page on a new CMS (Kentico) where they could confirm their attendance whilst also learning more about Classic Holidays (rather than keep it a secret). This allowed better planning because a trigger was built in that sent an optional reminder SMS should they not have confirmed within a predetermined timeframe. By using sophisticated web tracking tools (Woopra), we were also able to see whether the prospect had visited the site and analyse what information they had accessed. This gave insight into the reasons why people might “no show” and allow Classic to change their future messaging accordingly. We did not have the capacity to undertake AB testing but this would have been a benefit to learn and adapt the landing pages more quickly. However, the insight gained was a real game changer and has seen Classic become better placed to increase Sales. When a guest clicked on either the SMS or email call to action, they were taken to a personalised landing page which congratulated them on winning a prize and gave them further information on the presentation and more reasons to confirm their attendance. Once they confirmed, the status of their booking was updated in Sugar to reflect their intentions. This enabled the Sales team to have greater confidence in the likely attendance and ensured that Sales Managers could have the right number of Sales Representatives available for each Wave. A Wave is a scheduled set of concurrent one to one Sales Presentations (known as Tours) by a Timeshare Sales Rep to the prospective Members. It typically consisted of a PowerPoint style presentation which resulted in various membership options being offered to the Guest. The Waves therefore have a number of tours to be filled in order to keep the Sales Reps productive. These waves occur at the local Sales Office and can occur three or four times a day. Calendar management met this requirement perfectly and through the use of web services, a web front end was built which could allow these Waves to be exposed to OPC’s via the OPC Portal who could create Leads and assign them to Waves where there was availability. We were even able to create wait lists to ensure that each wave was well attended. The new solution allowed Sales Reps to know who was attending and, by capturing the lead within CRM, allowed downstream processing without the need to re-enter data or, even worse, asking the guest to complete more forms! On the day of the Wave, often wary prospects would arrive not knowing quite what to expect. Despite friendly receptionists and a warm welcome, the prospect was given a pen, paper and clipboard and then asked to complete a paper registration form. Ironically, the details asked for were already known by the OPC but until CHARM, there was no sharing of data. Now, the experience was rather different: On arrival, they were asked their name which was already on the Manifest having been added by the OPC. The Status of the booking was determined by whether the Prospect had confirmed. The Receptionist now was able to check them in “online” which generated a QR code on the screen. The Receptionist then scanned an iPad against the code which opened up an online survey on the iPad (replacing the paper form and clipboard). A digital signature was also captured to acknowledge refund of the deposit which was then emailed automatically to the Prospect as a PDF. Once the survey was complete, the status in CRM was updated to reflect the transition in Sales Stage. The Sales Representative then took the Prospects through a “standalone” presentation. We identified that we could rebuild the presentation into Kentico and incorporate data from SugarCRM and, in turn, export the data captured. This became a secondary project (known as S2S) in itself which I will blog about separately. For the purpose of this initiative, the only direct intervention was for the Sales Representative to update SugarCRM with the outcome of the Tour. This translated the Sales Opportunity into either a Won or Lost state. For those declining to become Members, they were still awarded their prize which, in turn, generated a new Lead to reconnect with the Prospect whilst they enjoyed their gift. For those who decided to buy, the next stage was to create the paperwork necessary for them to become Members. This process was known as “The Button Up”. The Button Up process is where once a Prospect agrees to purchase, the deal is finalised or “buttoned-up” with all the paperwork and, if required, finance organised. Prospects are entitled to a 7 day cooling off period. Many of the documents require signatures and the long standing process required much printing, manual entry, signing, scanning and photocopying of documents. As SugarCRM already had a lot of the data required from earlier stages of the process (Guest Survey, Booking etc), we created digital images of all the documents which were populated with data already captured upon an opportunity moving to a relevant status. This was a big time saver. We also integrated Docusign, an electronic signature solution, which allowed quicker completion of the forms although the real benefit would come later when guests wished to buy additional products (i.e To upgrade their Membership) from home. The Button Up process could take up to 90 minutes. The CHARM solution dramatically reduced this and also allowed the downstream processing to be quicker (I.e Loan Approval) as the forms were now digitised. Memberships were bought for periods from 7 years up to lifetime (>60 years). The longer the Membership purchased, the more expensive it became despite offering better value. Classic Holidays were able to offer financing through an associated Financial company. Loan Applications can be typically arduous and although we digitised the application form, little benefit was seen until we were able to integrate to ARMNet, the Loan Management software solution used by the Finance company. This allowed real time decisioning and drastically reduced processing time as the staff no longer needed to re-key the application into the ARMNet solution. The data required for a Loan and Membership Application was captured in SugarCRM (see below) and interfaced to ARMNet as well as prepopulating the forms ready for signing. In the 7 days post Tour, many new prospective Members suffered from “buyers regret” and therefore the churn rate is often high. However, the CHARM solution now offered the potential to communicate digitally during the cooling off period with personalised offers and comms. A legacy system, Viewpoint, written by a small software company, At Work International (recently acquired by Classic Holidays) was used to manage inventory (rooms) at resorts and bookings for members. It was not envisaged to replace this system but I proposed that in the future, Classic should use Sugar as the main interface for Members. SugarCRM could call web services to check inventory, make bookings etc. At the time of leaving, this had not been started but will further transform Classic Holidays once complete. Once linked to a Member, personalisation of the digital channel throughout the Membership lifecycle can occur with relevant offers and options being presented across multiple channels. Therefore the conversion of a Lead to an Opportunity to a Sale needed to go to the final step: A Member. In conclusion, CHARM has opened a world of opportunity for both Classic Holidays whilst also improving the overall Customer Experience. What was a once amateurish, shady Sales process is now professional and transparent. Of course, Timeshare is not for everyone but given the high degree of customer loyalty experienced by Classic Holidays, this new process can only bring benefit through efficiency and reducing churn in the Lead to Sale process. Massive kudos to the Classic Management and delivery team and the Project team (including the SugarCRM System Integrator, CRM Online ) that I put together. There are too many to mention but the recognition goes to them. For years, I have been preaching to anyone that will listen that the strategy must come before the software. People + Processes + Technology. I have used examples such as buying a car to explain my argument. Most people would not go out and buy the car that looks best. They would first of all decide what they need a car for. They might then decide on a few criteria to narrow the search depending upon their own needs. safety, Speed, Economy, Luggage capacity, Auto, Price etc. Once this “strategy” had been reached, the search for a car could begin. I have always believed that CRM software should underpin the business strategy and facilitate providing benefits to the organisation and its clients. However, maybe I was wrong? Technology is now at a stage where it is providing features and capabilities that can INFORM a Strategy. In other words, a business strategy could be built around a CRM tool. Having seen some of the latest tools and capabilities from the likes of Salesforce, Sugar, Oracle, Kana etc, I am increasingly convinced that for many organisations thinking about CRM, the software could give them market leading strategies and game changing capability. There are capabilities that many companies would not have thought of which might create huge value. In the past, industry processes led the design for software. Now it seems that software design is opening new doors for business processes. Just look at how Social Media has “forced” organisations to change its internal and external processes. Does your organisation have a Social Media strategy? If so, I bet it has only been developed in the last two years. I can imagine young or smaller enterprises could benefit from this wave of new capability. App Exchanges and Open Source platforms are driving a wealth of rich, new CRM capability that is beyond the imagination of most companies. With immature processes and potentially tight budgets, a software led strategy can help enforce new processes (that could be leading practice for that industry) and can help cement in customer centric processes. However, I still believe that larger organisations will need to develop strategies first and then find software that can support and extend those strategies. It will be interesting to see how the SaaS model affects uniformity and adherence to standardised processes and whether we do start to see software led customer centric transformations. I would be very keen to hear any thoughts or experiences on this topic. 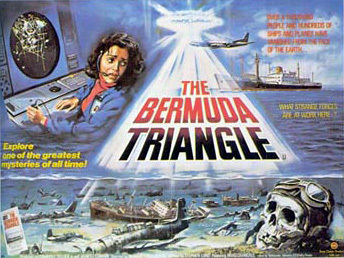 Many Projects and Programs disappear into the Bermuda Triangle, never to be seen or heard of again. 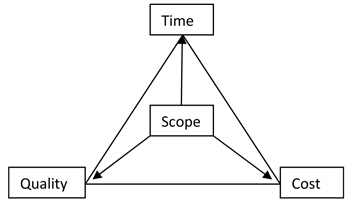 By understanding the relationship between Time, Cost and Quality, you can set a course through the triangle and avoid making fatal compromises. Are you brave enough to enter The Bermuda Triangle? It is scary, I’m afraid. Look at that queue. I just haven’t got the time to wait. It is expensive and surely not worth it. It is unsafe. I have heard of accidents. However, all of the while there is this niggling urge to do it despite these concerns and fears. You just know that your esteem will rise for having overcome your fears….and excuses! Facing up to any transformation, whether it is a Customer Experience Transformation or a change to your working life, it can be just as daunting and the same fears can rise to the surface. However, these fears are very real and to increase your chances of success, I believe it is necessary to plot a course through these concerns, which I refer to as the Bermuda Triangle, where many Projects and Programs disappear never to be seen again. The Bermuda Triangle is located between three waypoints that each have a major bearing on any type of project. The interesting thing is that you can only be in one place at any one time and you will therefore compromise on the other two. Therefore determining which waypoint is of primary consideration on your initiative will help plot a course and set expectations appropriately. Lets consider each in turn. You are in a hurry and need the transformation to be completed within this Financial Year. To achieve that outcome, Cost and Quality are likely to suffer. You will probably need more people in order to complete tasks earlier and to take shortcuts that probably compromise quality. Conversely, if time is in plentiful supply then you could compromise on cost (spend more) to give you high quality or compromise on quality to help lower costs and obtain quicker results. A great example is the building of the Segrada Familia. Clearly Cost and Quality were impacted hugely because it was determined to take as long as it takes. It is a very costly and high quality building. Hopefully your project will not take as long! How much is your budget and are you willing to compromise either time or quality to get the outcome you are seeking within your budget? If cost is the biggest consideration, you may have to consider lower quality (ever heard the “pay peanuts, get monkeys” expression?) and/or take longer. The GFC has left us with many examples of unfinished projects that simply ran out of cash. Perhaps it is better to compromise on cost by setting an affordable budget which will deliver something, albeit at a lesser quality than one might have hoped. If you want High Quality, it will typically come at a price (cost) and take longer (time) but as at the Segrada Familia, that may not be an issue. I am amazed at how often I have met business leaders who say Quality is THE most important aspect yet they are unprepared to find extra money or time to enable quality outcomes. By compromising on Quality, you might be able to get a quicker or less expensive outcome. That is why this conundrum is the Bermuda Triangle of Projects. Without a clear understanding and agreed direction amongst Business Owners and Project Sponsors within the Cost, Time and Quality dilemma, the project will struggle from the first point at which a decision needs to be made regarding a variation of any nature. Talk about each of these considerations and agree where your project sits within the triangle. This then determines the SCOPE of your initiative which delivers against these three considerations. Be wary of “scope creep” where additional requirements get added in to the scope. Once more, this variation will cause on impact on Time and Cost if the additional scope is agreed to, Quality if the additional scope is rejected. 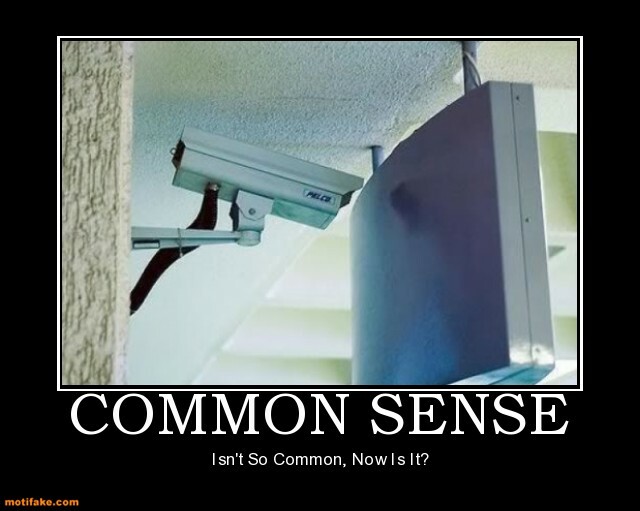 This dilemma is not specific to CRM but I thought I’d share it as it is pure “common sense” and as my Dad always told me “common sense ain’t too common”. I hope this helps in some small way. Buying a CRM system? These tpis from an Independant CRM Specialist can give you food for thought before you start the procurement process. As a Vendor and Purchaser of CRM, Nick provides some tips based on years of experience to help mitigate risk, reduce cost and make a quality decision. Over the years, I have been both a Vendor and Purchaser of CRM systems. I have always maintained that choosing the right CRM system is not one of the critical success factors for an Organisation wishing to gain benefits from a CRM initiative. It is , however, the subject of many long hours and a lot of the program costs. It is also highly emotive as many stakeholders will wish to have a say and influence the eventual procurement decision. However, a lot of time and money can be saved by establishing some ground rules and a strategy up front. Without wishing to patronise Procurement Specialists, I argue that by considering a few simple tips, a decision can be reached more quickly, cost effectively and lead to better outcomes. Therefore, this blog highlights a few suggestions aimed at helping Organisations wishing to buy or upgrade their existing systems. These tips are based on experience, not theory and is certainly not an exhaustive list. Neither is the list in any particular order of priority! Many Organisations put together a RFP (Request For Proposal) by compiling or acquiring an exhaustive list of generic features or functionality and then score vendor responses against “weighted” values such as Highly Desirable, Desirable and Very Highly Desirable, even Mandatory. The challenge of this approach is that business users are often lulled into stating system attributes or features that may bear little or no difference to their future “To Be” process. It becomes more of a “wish list”, rather like a child compiling a list for Santa having visited the Toy Shop. A better approach is to take the requirements to a higher level and then determine which group of functions is likely to be important for the future. Lists of generic “functionality” or requirements can be bought on the Internet. These lists are very thorough and detailed, often drilling down to a level where the relevance of each function may not be understood. Keep it simple and just use the groupings or categories to give vendors a good idea of what you are looking for. Another reason for doing this is to be fair to the vendors who could have overly high opportunity costs to fully respond to 2648 questions (as I saw recently) where the RFP had gone to 15 vendors. In that example, I decided that the effort to respond was not worth the small chance and we chose not to respond. The sad thing is that we might have had the best solution. Getting the weightings right to score the responses and presentations is critical. Start at the highest level: What weightings should be applied to different aspects of the Procurement? Price, Functional Fit, Non Functional Requirements etc? Often the Business users will wish for a higher percentage on Functionality, I.T will push for Non Functional with Finance and Procurement keen on Price or Value For Money. I cannot say how you should do it but I will stress that the overall weightings will greatly affect the decision you eventually reach. The weightings are then cascaded down through to the requirements and open questions. My suggestion is to keep in mind that what the system does is not the main success factor. Compromises may have to be made in order to get, for example, broader integration versus deeper functionality. The irony is that the impact of the weighting decisions (often made before issuing the RFP) is not really understood until you start the short listing process. That is the time when earlier weighting decisions may be regretted. Spend a little longer to get this right and the quality of the final decision may be much better. We have all heard of examples where the “software was poor” yet subsequently changed (at great expense) for something just as bad. The irony is that the same “poor”software is being used elsewhere and delivering value. Every software vendor has customer reference sites and customer horror stories. The difference is therefore not the software. It is the people and the processes. I cannot stress enough but to become truly customer centric, you must regard CRM as a transformational journey and ensure that people are willing and able to change to adapt to the new world enabled by the software change. Similarly, the software must enable great processes that deliver internal and external benefits. We have all experienced ringing a Call Centre to be routed around the organisation before finally reaching the right person. It may be great technology employed but you cannot hide a bad process. Implementing cRM with poor processes is like putting lipstick on a pig. Therefore when buying CRM software, make sure the business representatives are change agents who are not bound by what they have always done. Similarly, stretch the vendors by testing their industry understanding to propose new processes and practices, rather than just reimplement what you do today. So you are buying new software. Who will implement it? The Vendor? A Systems Integrator? A Shared Service provider? Maybe your own I.T department? The answer to this question should drive part of the assessment. What skills are required to administer the system? How will Knowledge Transfer be managed and assured? What training is available, where and how often? Again, there is not a prescribed answer to this but the overall strategy is hugely influenced by the direction your Organisation chooses to take. The implementation is (in my opinion) more important than the software being deployed. Make sure the implementation is considered aspart of the decision with at least the same importance as the choice of software. Your IT department should be the facilitators to the process by providing an Organisational strategy and Architectural direction to which the solution should comply and conform. Decisions such as Cloud, Integration, Database and other Enterprise considerations should be informed by I.T and help the procurement. This direction should be reflected in both the weightings and evaluation team composition. However, be wary of the situation where IT chooses a solution on behalf of business users. In CRM, the importance of adoption and acceptance by the end users is probably more acute than in many other types of software selection. The trade off between IT and the Business is often as necessary as it is emotive but without trade off, time and costs escalate and the “losing party” often starts to undermine the chances of future success. The size of the Evaluation team will vary by Organisation but I tend to find that the larger the Organisation, the more likely it is to have an unnecessarily large evaluation team. It goes without saying that the larger the team, the higher the cost and the slower the process. Does it lead to better decision making? I don’t think so because the internal politics are then brought into the Evaluation team. Surely it is more important to create a lean and empowered team who can represent the interests of multiple departments without feeling the need to follow a particular political directive? This may sound like a Utopian state but it should be the objective of the overall Owner to create the optimal team to represent the best interests of the Organisation (not department). One other consideration is to empower a panel representative of differing levels of seniority. It is often a mistake for Managers to buy a system for their staff to use and vice versa. Ensure staff from the most junior to the most senior are represented on the assessment panel and decision making. If you want to really test (and differentiate) your shortlisted vendors, develop some typical business scenario’s that require a product demonstration requiring flexibility and creativity. Do not ask for what you do today. Imagine a future state and a desirable outcome. For example, imagine you are a traditional retailer. Create a scenario asking the vendor to demonstrate how their solution could utilize new channels and media to identify and acquire new customers whilst measuring the impact and effectiveness of each channel? That scenario is not prescriptive or specific. It allows the vendor to demonstrate potential value of their solution whilst offering you a glimpse into their understanding of your business and industry. A good vendor will have researched your needs, your weaknesses and gained a good idea into the potential opportunities their software might provide you. Give them a scenario whereby this can be demonstrated. In saying that the scenarios should not be too prescriptive, it must obviously cover your requirements as highlighted by the categories described in Tip#1. If you make a requirement “Mandatory”, it has the potential to eliminate solutions that may have been a strong fit otherwise. Therefore think very carefully about what should be mandatory and use it as an initial screening process. For example, imagine you are an international business and believe that your solution must be multilingual. If you make “Multilingual” a Mandatory requirement, you will eliminate a large number of solutions that may currently only have one or two languages. Is that requirement truly a “Showstopper” or is it just simply very highly desirable? By making it a “Very Highly Desirable” requirement, you can assess these solutions without them being rejected as non compliant. Usually, the first pass of assessments eliminates vendors who are non compliant. Therefore only make requirements that you simply cannot operate without the only ones that are mandatory. This tip may not sit well with many but, in my experience, it is easier to seek compromises than it is to live with the implications of the wrong choice. One of the often hidden and unforeseen aspects of procurement surrounds the strategy once the solution has been deployed. Who will provide Support? Is it required 24/7? What is the Upgrade strategy and frequency? What is the future product roadmap and vision? Often Evaluation Teams can be caught up in what the solution can do today rather than thinking about the future state. One can never predict the future but mitigation should be considered for different scenarios and be managed within the procurement process. As a former General Manager responsible for the CRM Product of a Software vendor, I was often asked to make commitments to future development but was rarely asked to commit to this new functionality contractually. Why not? I would have been happy to had I been asked but without the contractual need, the client has no assurance of that future capability which increases their future risk and exposure. Even if software companies cannot commit to future development, this could be used as a bargaining chip in negotiating price. There is a big difference between intention and committment, especially to Software providers! How will you measure whether you made the right choice? It will be whether your business case was justified. Therefore a win/win scenario whereby your vendor helps develop and is incentivized to help you realise genuine benefits (and thereby justify your business case) is compelling. These benefits must be quantifiable and the inter dependencies (people, process etc) understood and managed. However, wouldn’t it be nice to select a vendor that is motivated to help you realise benefits rather than simply deploying software for a set price? This may again sound utopian but it is the way things are moving in our customer centric universe and is worthy of consideration. Of course, these tips are only suggestions and you may get great outcomes even if you ignore them. However, I do believe that these can only add value to you and hope that they do help in some small way. Good luck! The ABC of CRM Create a free website or blog at WordPress.com.